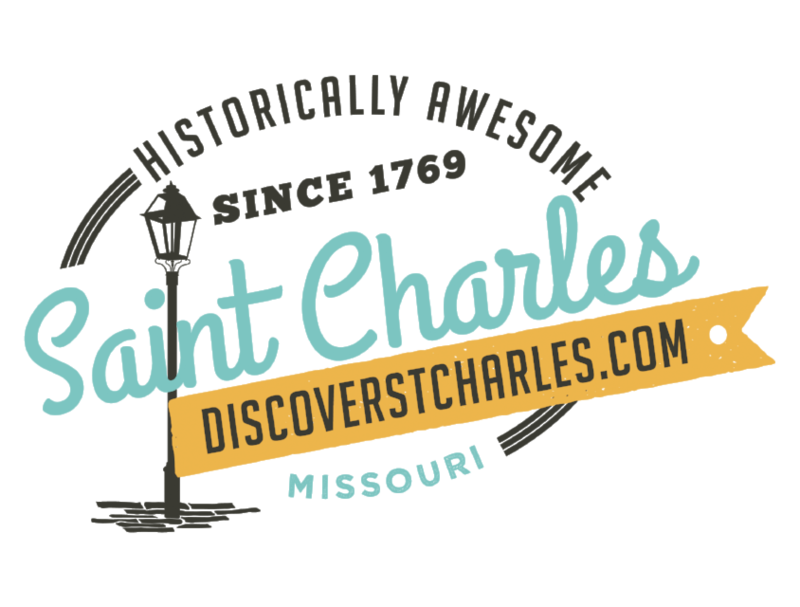 Christmas Traditions® is a month-long celebration of Christmas in St. Charles. The festival runs Wednesdays, Fridays, Saturdays and Sundays from the day after Thanksgiving through Christmas Eve. In addition to the 80 plus characters who are always "making seasons bright", there are a host of other activities to enjoy while you&apos;re in St. Charles for Christmas. 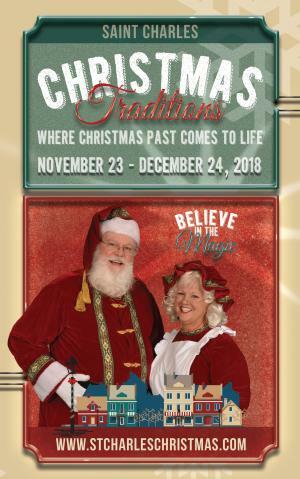 The 45th Season of Saint Charles Christmas Traditions® will begin with the arrival of Santa and Mrs. Claus, escorted by the Lewis & Clark Fife and Drum Corps and all of your favorite Legends of Christmas. Join Mayor Sally Faith and the Cobblestone Wassailiers for the annual lighting of Saint Charles&apos; Official Christmas Tree. While you&apos;re there, take the chill off the evening air with a complimentary cup of piping hot wassail. Parade Route - 1000 South Main Street to the Jaycee Stage in Frontier Park On Opening Day as well as every Saturday and Sunday during the festival, Main Street comes alive with the music, pageantry, and spectacle of one of the best loved Christmas Traditions events: the Santa Parade. Cheer and celebrate as all of the Christmas Traditions characters and carolers come together in a special procession to the Jaycee Stage in Frontier Park. You won&apos;t want to miss the parade&apos;s grand finale, as a cavalcade of our international Santas, each carrying the flag of their native land, herald the arrival of Santa and Mrs. Claus and their horse-drawn carriage. Follow the procession as it makes its way from the 1000 block of South Main Street to the Jaycee Stage in Frontier Park, where the parade will end with a short family-friendly program. Kister Park Gazebo - 400 Block of South Main Street Enjoy an interactive presentation of Charles Dickens&apos; "A Christmas Carol" that is sure not to be a humbug! Watch as Ebenezer Scrooge relives that fateful Christmas Eve night with the help of a few surprise Legends of Christmas! Berthold Square - corner of South Main and First Capitol Drive Come enjoy the dulcet tones of Saint Charles&apos; own Cobblestone Wassailiers as they all join together for a concert. Singing many of your beloved carols, and beautiful songs that you&apos;ll be delighted to hear for the first time, our carolers promise to provide a concert both young and old will enjoy! 900 Block of South Main Street to Berthold Square Each day of Christmas Traditions ends with our special candlelight procession. Join this lovely procession in Berthold Square, where the Cobblestone Wassailiers will lead a sing-a-long of traditional Christmas carols under the glow of Saint Charles&apos; official Christmas Tree. Berthold Square - corner of South Main and First Capitol Drive Have you been given the cold shoulder from your favorite friends? Wishing to chill out with some of the coolest Legends of Christmas? Don&apos;t get cold feet! Come meet Jack Frost and his pals for the best ice block party on Main Street. This hoopla is "snow" joke! Kister Park Gazebo - 400 Block of South Main Street Twirl, tap, or taffy twist your way to the gazebo in Kister Park to boogie along with Clara, the Nutcracker Prince, and Sugar Plum Fairy. Showcase your best dancing skills or learn some sweet new moves. You&apos;ll leave with visions of sugar plums dancing in your heads and carols ringing in your ears. North Main Street Traditionall, Krampusnacht happens on the eve of Saint Nicholas Day, but we&apos;ll be enjoying a weekly visit from some of Santa&apos;s naughtier friends on North Main Street. Make sure to join Krampus and his friends at 8:13 PM each Wednesday in the Colonnade to watch him spin his "Wheel of Misfortune"! OPO Plaza - 119 South Main Street Share in the sounds of the season as guest choirs from across the region present a program of special music and joy. These schools and community groups are sure to have you smiling and reminiscing about holidays gone by and help you begin new traditions as well. Backyard of the First Missouri State Capitol State Historic Site - 200 South Main Street You know Dasher and Dancer and Prancer and Vixen - now get the chance to meet some of their antlered brethren up close. They won&apos;t be playing reindeer games, but you won&apos;t want to miss the chance to visit with and have your photo taken with these beautiful animals. Parade Route - 1000 South Main Street to Jaycee Stage in Frontier Park As another year of Christmas Traditions comes to a close, you won&apos;t want to miss the opportunity to say so long to your favorite Christmas Friends as they gather in Frontier Park for a cheerful Closing Ceremony that culminates in the annual Santa Send-Off! Come and cheer Santa and Mrs. Claus as they board a horse-drawn carriage to head back to the North Pole in preparation for the big night.